Teacher Fact: "Field trips are fun, but involve counting...and counting...and counting." At the beginning of school for the last few years, Cam has requested the following: "Mom, please sign me up for every field trip." 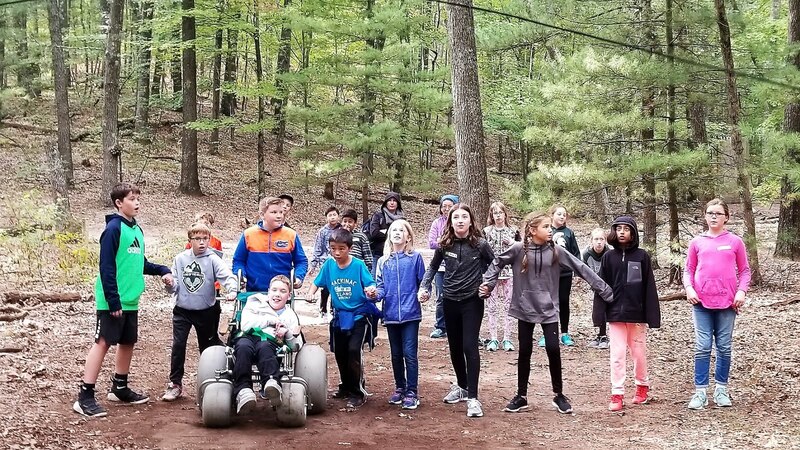 For the first outing of this school year, the 5th graders were off to Camp Roger on Thursday. 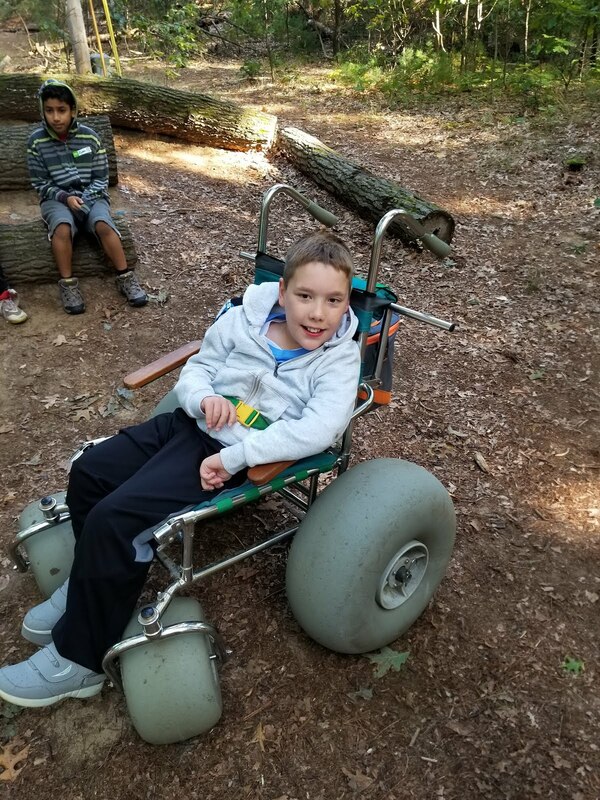 Camp Roger, located in Rockford, Michigan was established in 1913, and contains more than 200 acres filled with natural wetlands, forests and wildlife. Chris took the day off of work to accompany his son out in the wild. 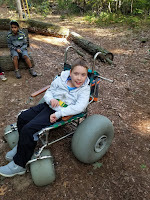 Due to the terrain, the camp has an outdoor wheelchair to use, reminiscent of the Cam-mobile. 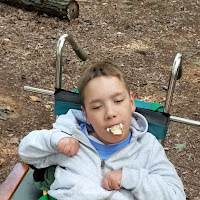 The kids completed five activities, one of which was eating toasty marshmallows! Cam's classmates were eager to help and assist when needed. It was a long day but full of fun experiences. Auntie Karen arrived Friday to hang out with us for the weekend. Saturday was perfect fall weather for the WMML baseball game. It was a bit chilly and the sun shone through the pretty puffy clouds. Ms. Barbara, Cam's first teacher at his former Meadow Brook Elementary arrived at the game and the Cam Fans were in full force with Oma, Opa, Auntie Karen and Barbara. 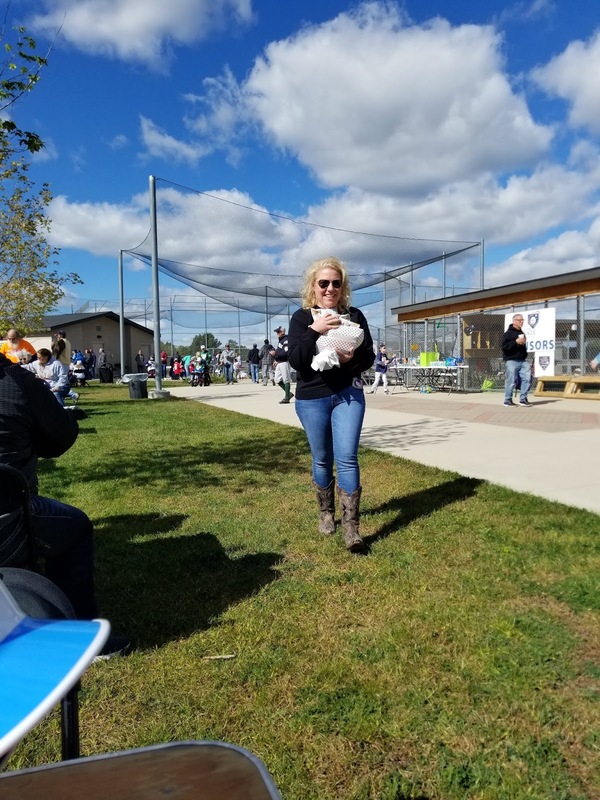 Saturday, September 29th marked the 5-year anniversary of the West Michigan Miracle League! After Cam's game, a potluck of hot dogs, brats, chips and desserts were available for all to enjoy. Many tables and chairs were set up so everyone could eat and visit. 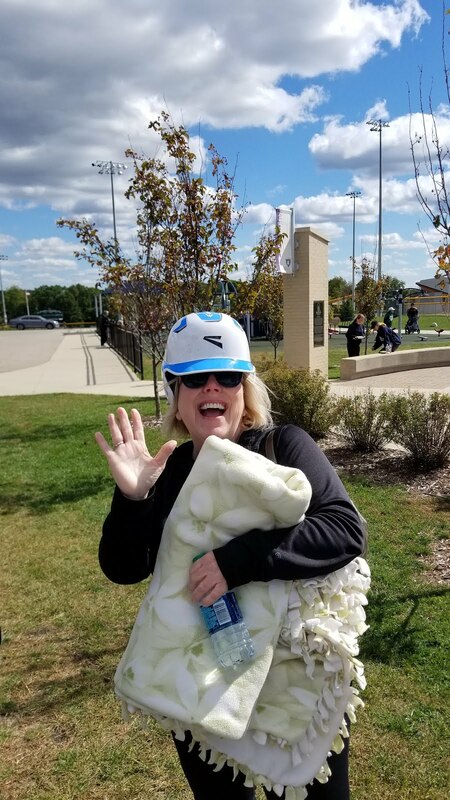 Jane gathered some food for the group and proceeded to run into one of the coaches who said "my goodness, you must be hungry!" We also spoke with the president / commissioner of our Miracle League - Tony Comden. He had hosted a banquet earlier in the week for community leaders and had some WMML pictures enlarged and placed around the banquet area. Tony found us and gave us a 24x36 photograph of Cam and his best friend, Brody. We found a frame and it now resides in our sunroom. Tony's comment of the photo: "This is one of my favorite pictures because it shows what Miracle League is all about and everyone sure loves Cam's smile!" Our weekend project lists have earned Cam the unofficial title of "taskmaster" in our household. Jane had put off requesting assistance with a computer issue on her work computer. Chris of course, with Cam's prodding, had it resolved in about 5 minutes. "See Mom, you should've asked Dad for help sooner!